ZOMG! HEY U GAIS! It's like TOTALLY the LOST WORLD except REAL! via ontd_political and The Guardian. This link will take you to a story about how the scientists finally got into the volcano's caldera. You can hear an audio of the adventure here. And also check out the awesome pictures of the new species. 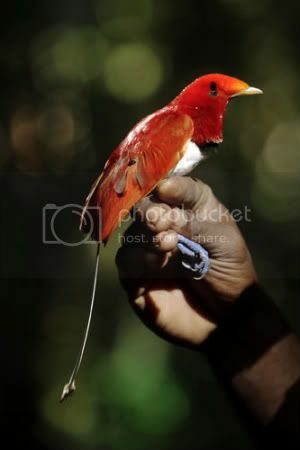 As a taste, check out the newly discovered king bird of paradise. Tell me that doesn't look like a phoenix. Photograph taken by Ulla Lohmann/BBC and published in The Guardian on Wednesday, September 9, 2009. Happy 09/09/09 everyone! Wish me luck with my Novocaine adventures, because baby needs her teeth drilled this afternoon.